Our offices in Horsham and Philadelphia, PA are staffed with professionals that care about the safety of your oral health. Practicing great at-home oral hygiene can help us maintain your oral health so it keeps you out of our dental chair for extended periods of time and out in the world showing off your smile. 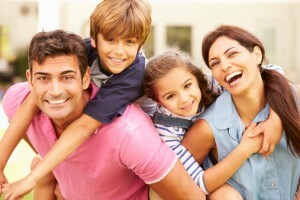 Dr. Henkel is the Horsham family dentist that can help keep your oral health in good standing. He too often sees patients that are lackadaisical with their oral hygiene, and this can lead to many dental problems. As a parent, there’s a lot you can do to help keep your children’s oral health intact. You’d be surprised how easy it is to help keep your oral health in fantastic shape by taking the time to practice great oral hygiene habits at home. Practice proper brushing with your kids: No matter what age, it’s important that teeth are cleaned via a toothbrush. Many people, kids especially, aren’t usually privy to the correct way to brush. Remember, hold the brush at a 45-degree angle and use gentle, circular motions over each tooth so that nothing is missed. Don’t forget the tongue – it’s often the most overlooked region in the mouth for brushing. A family that flosses together, stays together: Flossing is often not practiced during the morning and evening brushing routine. Flossing even at an early age is very beneficial for young mouths. Cavities are the result of extensive tooth decay that can occur between the teeth. Food particles and other harmful bacteria can build up and result in devastating consequences. Flossing removes these harmful food particles and other bacteria. By practicing flossing with your children, they’ll be more eager to keep their mouths extra clean. Plan your family’s dental visits: It’s a good rule-of-thumb to visit us for a general checkup twice a year, or once every six months. It’s these dental checkups that are they key to sustaining great oral health. It gives our dental team a detailed look at the current state of your mouth. Great oral health can be achieved for your whole family by taking the extra steps to ensure they’re practicing good at-home oral hygiene habits as well as scheduling regular checkups. Dr. Henkel is the dentist Horsham families can turn to for excellent service and specialized care.